Last time I was in Korea, I walked into a lamb restaurant but got turned away because I was a solo diner. So when a teammate asked me if I wanted to have dinner tonight, I suggested that we go get lamb. He thus took me here (26-12 Samsung-ro96-Gil, 2-567-4787), and to my surprise, I saw Chinese characters yang rou chuanr on the sign! 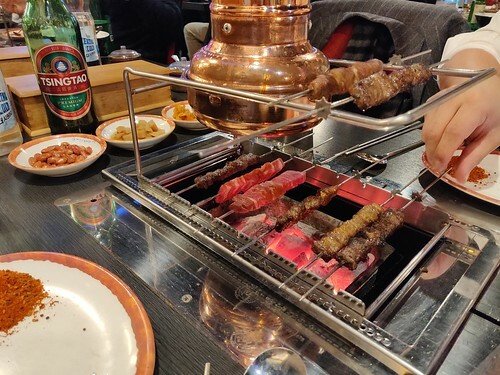 No, I didn't come all the way here to eat chuanr, but I was kinda curious to see how they localized it, especially since I had heard about how it had gotten popular in Korea lately with automatic skewer rotation systems. It is called yangkkochi in Korean, and there is even a place in Tanjong Pagar that offers it, right next door to Pasta Brava. I was surprised to find that I liked it better than Xinjiang chuanr, mainly because the quality of meat is superior (at this shop, at least). OK, Alati has the most tender chicken, but Alati's lamb has gotten horribly gritty, whereas these were choice cuts of meat interlaced with bits of tasty fat, and came with a cumin/chili dipping sauce. I liked it enough that we ordered additional portions of the same thing.